These Pages try to explain primarily the postal history aspect of this company, however, for a good measure also historical facts and background information's like company pamphlets and other miscellaneous items are shown. 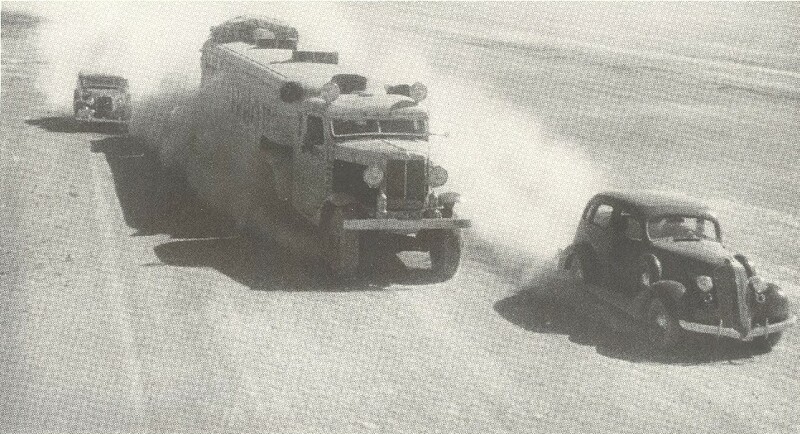 3rd Place in Class "Digital Media"
This picture gives you an idea how adventurous the mail transport and travel through the desert has been. 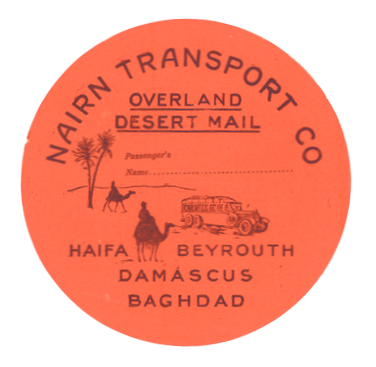 Bradbury Wilkinson photographic essays for a proposed "Overland Mail" stamps for Iraq added. In line with the UPU Circular 163 of 29 June 1940, indicating that as of 21 June 1940 mail from Palestine to i.e. 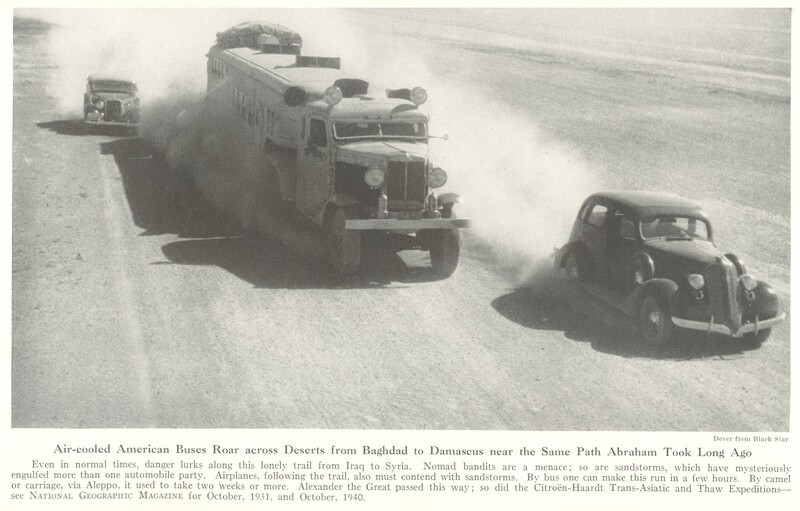 India will be routed via the Overland Mail Haifa-Baghdad i found the first such cover from Palestine via Baghdad to India reported. The earliest recorded use of Route Instruction Handstamp HS-08 (8) has been found by me and added. After many years of collecting and researching I finally can add an Imprinted Envelope IE-23. The new discovered item is dated 22 December 1928 and now the earliest used copy known. Finally, the original cover already reported on 12 May 2018 with new discovered Route Instruction Handstamp HS-N58, is in my collection and size of the route instruction measured and added. After many years the first advertising pamphlet with Arabic Text found. 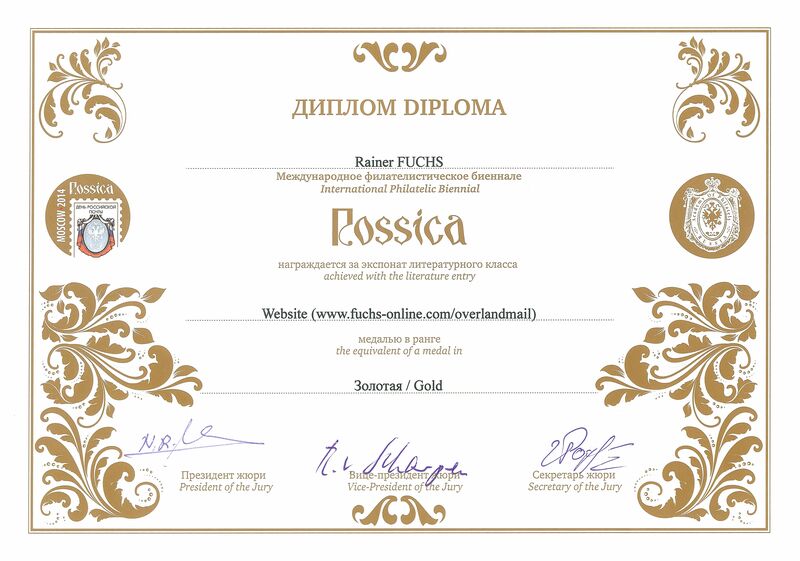 A variety of Imprinted Envelops IE-08 (VAR) discovered where the full stops (.) 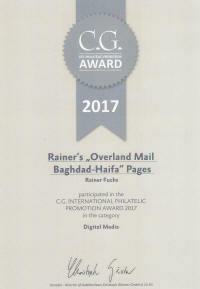 after MAIL and HAIFA in the Route Instruction are not underneath of each other. A newspaper clipping from a unknown newspaper, dated 30 August 1930, informing about the departure of the trial trip on 30 August 1923 and already informing about the postal rate and surcharge for the use of the Overland Mail has been added. Image of cover with rouletted Label L-10 added. I am glad to report the first new discovered Route Instruction Label since the monograph by Norman Collins had been published almost 30 years ago. The label is now listed as Label Type L-N01. More details will follow shortly. The cover with Route Instruction Label L15 (2) is now in my hands an high resolution images have been added. 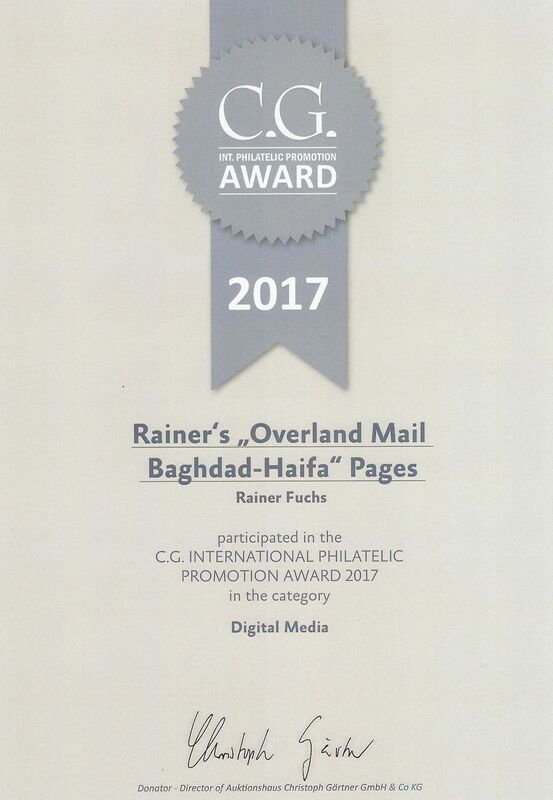 The section "The End of he Overland Mail" has been modified and separate pages with latest known covers from Palestine and Jordan (via Beyrouth) added. More covers will be added as I will be aware of them. Copy of cover with Route Instruction Handstamp HS-66 added. 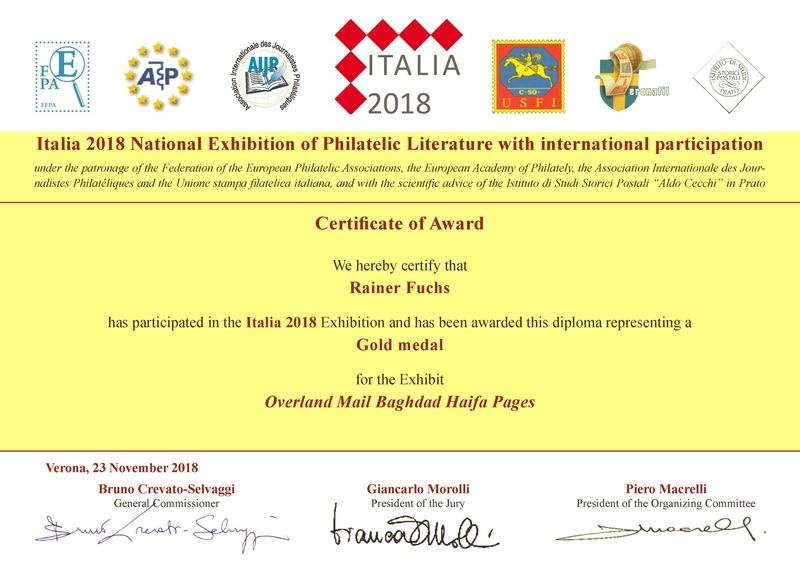 My Overland Land Mail Baghdad-Haifa Exhibit hosted by Exponate Online, the site of the German Philatelic Association (BDPh) has been embedded on this site. The images in larger quality can be viewed at the original site. Another strike of Route Instruction Handstamp HS-76 (5) added. The latest reported use of this handstamp. I have been informed about another cover with Route Instruction Label L15 (2), cover not in my collections, hence the images are not of the best quality. Deciphered the handwritten remarks on the draft Contract between Nairn and the Iraqi Post in October 1923. For older updates, please view the "Revision History" Page!